I’ve been here three times now: twice for drinks and once for lunch. I must say the best drink I had is the Affogato Quest. Strong.. and I forgot all about the alcohol when I ordering it. 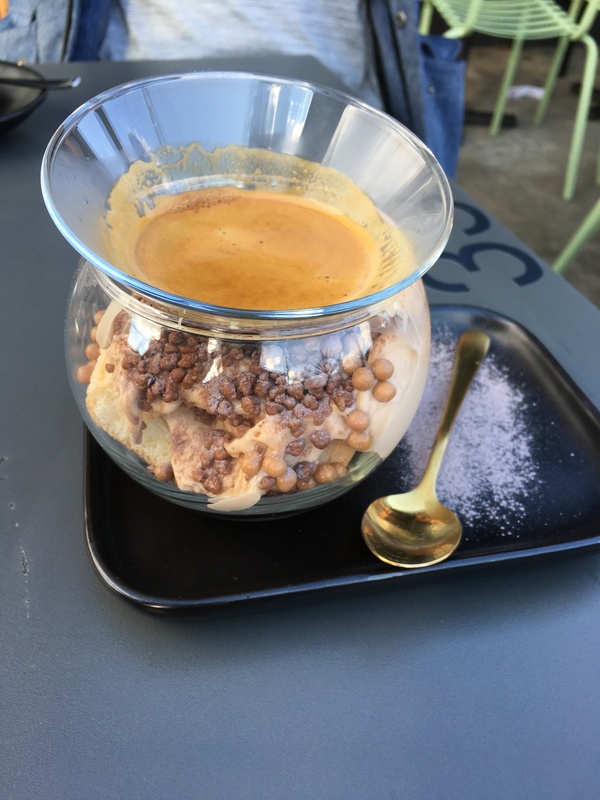 If you’re after a dessert infused with coffee – this is the one! I’ve tried their Matcha Maiden and Dirty Chai also… the Matcha Maiden was very diluted with milk/water. Although large in size a bit disappointing in flavour – not for my tastebuds. I felt confused from drinking the Dirty Chai (no photo as I did takeaway that time)… in all fairness, it was my first time trying a dirty chai latte, so it might just be me who dislike Dirty Chai in general! For my latest visit, I dined in for lunch. C & I both ordered a Morc Dark Hot Chocolate – 70% cacao. Another drink that felt diluted and watery… we couldn’t taste the dark chocolate. HH Cafe has a range of selections in the food menu – quite hard to decipher what you will be eating by just reading their the dish name. Suggest to choose wisely :)… J ordered Mad Hatter’s Breakfast, $26 – Sourdough Toast, Crispy Pork Hock, Pumpkin Pesto, Mushrooms, Chorizo Ragu, Hashbrown, Roasted Dutch Carrots. It was a good dish, we really liked their Chorizo Ragu tossed on top, although it looks heavy but it was good in flavour combination. C ordered Caterpillar’s Riddle $23, Mushroom, Taleggio & Truffle Baked Eggs, Mushroom Crisps, Rosemary Macadamia Crumble, Polenta Chips. Great idea to fry the enoki as mushroom crisps. When we first tasted it when it came out from the kitchen, you can feel it was a winter dish – warm & creamy. But as the dish cools down and you spoon for more, you start to get sick of the creaminess. Polenta chips were done well – it was dense as you would expect – J had a bite and enjoyed it. W ordered Tweedledee Burger $22.00 – House-Made Maple Brioche Waffles, Southern Fried Chicken, Spicy Maple Island Sauce, Pickles, Fried Egg, Red Onion. Add on the waffle chips – $4. W enjoyed it and I also had a taste – chicken was tender inside and crispy on the outside. The brioche waffle was soft. Definitely expect to eat with knife and fork! The waffle chips were perfect – lightly seasoned. As for me, I picked Benedictine Adventure $23 – Garden Pea Panna Cotta, Smoked Ocean Trout, Poached Eggs, Bacon Crumb, Potato Popcorn, Sourdough, Citrus Hollandaise, Salmon Roe, Fennel. Added Hashbrown for additional $4. The dish was theatrical! Unfortunately I wasn’t able to record my first impression to share here. When opening the lid of the jar it smelt so good – the trout was smoking inside. The smoke was there for at least 10 seconds. The Pea Panna Cotta was vibrantly green almost artificial looking. But pretty to portray a forest adventure. I started with tasting the hash brown and that was yum! Then I dropped dollops of hollandaise sauce in the jar, scooped up some smokey ocean trout and ate it together. Elements inside the jar went well together – the pea panna cotta was surprisingly sweet and it had crispiness from the potato popcorn peeking at the edges of the jar. BUT the hollandaise was not citrus-y at all and I couldn’t combine the hash, the bread and eggs together. The poached eggs and hash brown felt out of place. Would it have been better for the eggs to be inside the jar too? Lastly, dessert – we picked the Fig and Coconut Petit Gateaux, $8. We were after a light and fruity dessert. We could taste the coconut but lacked in figs… we think the white chocolate over powered the light figs flavours and wished it was more prominent. Nonetheless they won me over on presentation and their perfect short bread base.